Kinetiscope is a scientific software tool that provides the bench scientist with an easy-to-use, rapid, interactive method for the accurate simulation of chemical reactions. The package is available in versions for Microsoft Windows, Apple's Mac OS X and Linux, and includes extensive documentation for the user. 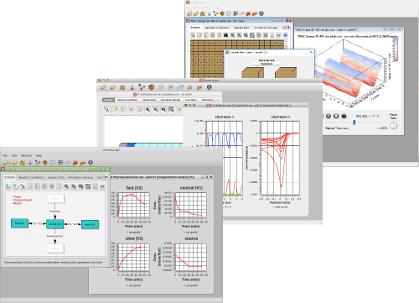 A powerful, accurate and easy-to-use kinetics simulation package, Kinetiscope was created by experimental chemists for chemists, chemical engineers and materials scientists. The program package is completely self-contained, and requires no programming or extensive user training. This lets you become immediately productive, even if you do not have a background in numerical analysis. In addition to being useful for the bench scientist and engineer, it is an ideal tool for teaching the principles of chemical reaction kinetics to students and trainees. Kinetiscope merges and extends software tools initially developed by the authors through their work in the chemical kinetics simulation project at IBM's Almaden Research Center in San Jose, California. An earlier tool from that project, the Chemical Kinetics Simulator or CKS, was released to the public with a no-cost license by IBM Corporation in 1996. Since then, CKS has seen broad use by the technical community, and has been applied to a diverse range of problems in scientific and engineering fields. Kinetiscope updates all functionality of CKS, and extends the underlying simulation technology to enable calculation of the kinetics of reaction and transport in three-dimensional and compartmental reaction schemes. Kinetiscope does not integrate sets of coupled differential equations to predict the time history of a chemical system. Instead, it uses a general, rigorously accurate stochastic algorithm to propagate a reaction. The stochastic method for kinetics simulations was first published in the early 1970's by Professor D. L. Bunker1 (University of California at Irvine), and by Dr. D. Gillespie2 (Naval Weapons Center, China Lake). The stochastic method is comparable in efficiency to integration for simple kinetic schemes, and significantly faster for stiff systems. It is superior for modeling reactions which depend on sporadic events and fluctuations, such as explosions and nucleation, and easily handles complex situations such as reactions in continuously changing volumes. A particularly useful feature of stochastic simulation methods is that they offer enhanced flexibility in setting up reaction mechanisms since they do not require explicit checking for conservation of mass and energy. Kinetiscope comes with a User's Manual, a set of tutorials and an extensive library of example simulations that show you the kinds of systems that can be studied with it and that illustrate techniques for handling various types of physical situations. The library includes simulations of gas phase, solution phase and solid state reactions such as co- and terpolymerization ... radical chain-initiated polymerization (including a sample spreadsheet for extracting molecular weight distributions) ... kinetic resolution of enantiomeric mixtures ... chemistry in supercritical media ... pH-dependent model enzyme kinetics ... thermogravimetric analysis ... temperature programmed desorption ... smog chemistry ... silane chemistry in a chemical vapor deposition reactor ... model batch and flow catalytic reactors ... curing of polymers with significant volume shrinkage ... synthetic protocols for preparation of a photosensitizer ... chemical oscillators ... electrochemical reactions studied by cyclic voltammetry ... photochemical reactions triggered by a pulsed light source ... pharmacokinetics of drug dosing ... and imaging chemistry in photoresist materials. D. L. Bunker, B. Garrett, T. Kliendienst and G.S. Long III, Combustion and Flame 23, 373 (1974). D. T. Gillespie, Journal of Computational Physics 22, 403 (1976).